The Republicans have given DOJ a Friday deadline to turn over probe documents. 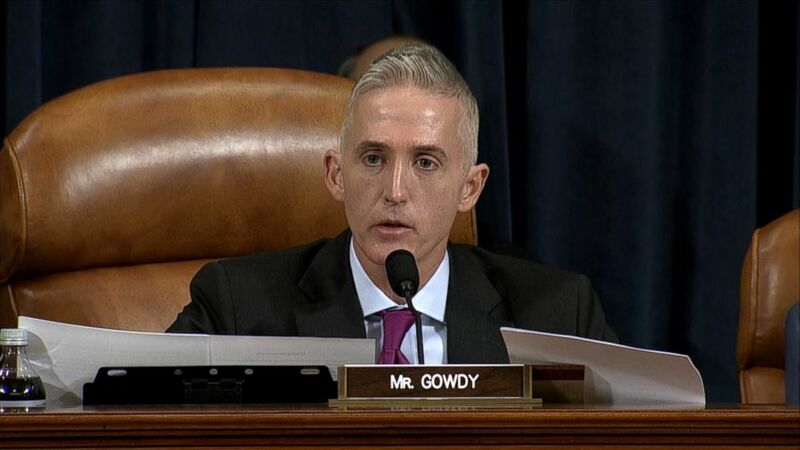 camera (ABC News) Representative Trey Gowdy, a Republican from South Carolina and chairman of the House Select Committee on Benghazi listens as Hillary Clinton, not pictured, testifies during a House Select Committee on Benghazi hearing in Washington, Oct. 22, 2015. A long-running battle has now escalated to the point where House Republicans are threatening top federal law enforcement officials with contempt of Congress if the Justice Department and FBI do not comply by the end of the week with document requests related to the Hillary Clinton email and Trump-Russia investigations. House Speaker Paul Ryan and other senior House Republicans met with senior Justice Department officials last Friday to discuss why they haven't produced documents sought by the House Oversight, Intelligence and Judiciary committees. Republican leaders gave DOJ and FBI until this Friday to comply, a source familiar with the meeting told ABC News. Lawmakers had not received all of the requested documents as of Wednesday. The House Intelligence Committee has been given access to a "small portion" of the documents requested, according to a congressional official. Ryan said Thursday that Republicans "expect compliance" from the Justice Department and would receive an update from the chairmen on the production on Friday. This week, the Justice Department delivered many of the requested documents, and last Friday the department agreed to provide explanations by the end of this week for any documents that the department determines it can’t hand over, according to a DOJ statement. The FBI did not immediately respond to a request for comment, but FBI Director Chris Wray said last week that while his agency has "an obligation to be responsive to legitimate congressional oversight" it also has "an obligation to protect sources and methods and not compromise ongoing criminal investigations." "We're prepared to take next steps to get what we need done," Rep. Mike Conaway, R-Texas, a senior member of the House Intelligence Committee who led the day-to-day operations of its Russia investigation, told ABC News. "If there's nothing untoward going on, they're putting up way too big a fight to hold back and to not give us the information." House Oversight Committee Chairman Trey Gowdy, R-S.C., told Fox News on Sunday that the House Speaker has "made it very clear –- there’s going to be action on the floor of the House this week if the FBI and DOJ do not comply with our subpoena requests." Gowdy warned that the House would "use its full arsenal on constitutional weapons to get compliance," including holding officials in contempt of Congress. 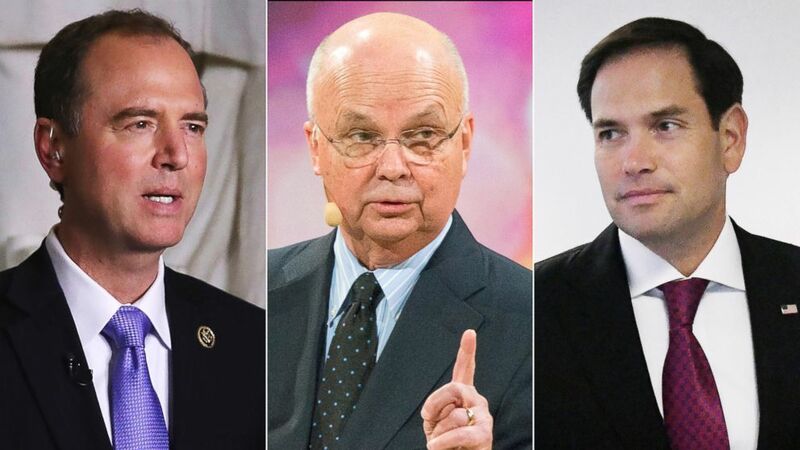 (Getty Images) House Intelligence Committee ranking member Rep. Adam Schiff, former Director of the CIA and NSA, Michael Hayden, and Sen. Marco Rubio are pictured in a combination image. Democrats are skeptical of Republican demands and told ABC News they consider the document demands to be part of an effort to discredit special counsel Robert Mueller's investigation. In recent months, House Judiciary Chairman Bob Goodlatte, R-Va., and House Intelligence Committee Chairman Devin Nunes, R-Calif., have issued a series of subpoenas demanding documents and information – some of it classified – from the Justice Department related to the investigations involving both 2016 presidential candidates. "We wanted to figure out what they were doing before and after –- right before and right after the opening of the counterintelligence investigation [into the Trump campaign and ties to Russia]," Nunes said in an appearance on Fox News on Sunday. "We asked for specific information and documents." Some Republicans expressed frustration with DOJ leadership Tuesday at a marathon hearing on the DOJ inspector general's report on the Clinton email investigation with inspector general Michael Horowitz. (AP/Getty Images) Deputy Attorney General Rod Rosenstein, speaks to the media, Feb. 16, 2018, in Washington. Paul Manafort, former campaign manager for Donald Trump, walks out of the U.S. Courthouse after a bond hearing in Washington, Nov. 6, 2017. Former FBI Director Robert Mueller departs Capitol Hill on June 21, 2017. 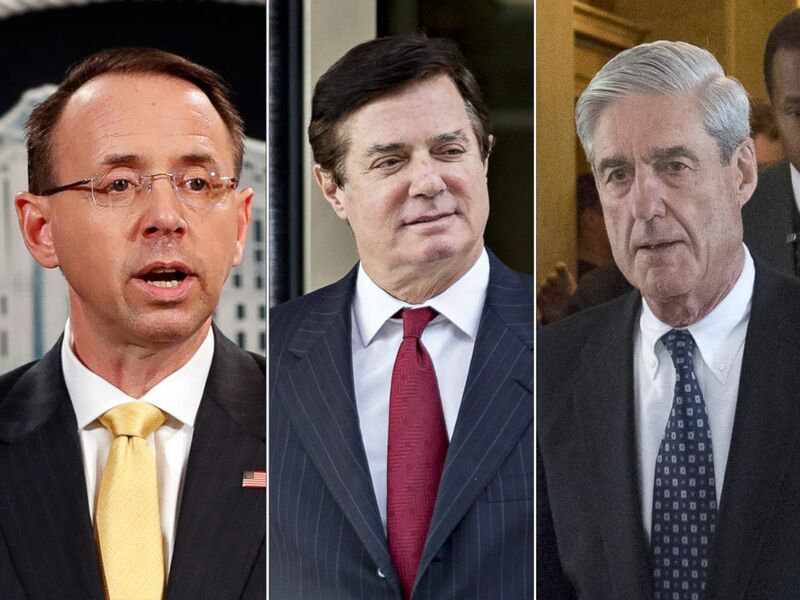 One lawmaker, Rep. Jim Jordan, R-Ohio, accused Deputy Attorney General Rod Rosenstein -– who is supervising Mueller's Trump-Russia investigation -– of trying to hide controversial text messages between two FBI officials, Peter Strzok and Lisa Page. In an August 2016 message, Strzok, who led the Clinton probe and FBI investigation of Russia's efforts to interfere in the 2016 election, said he would "stop" Trump from becoming president. "Mr. Rosenstein decided that we couldn't get it until your report came out," Jordan said. Horowitz said his team found the exchange in May and referred the newly discovered text messages to Rosenstein's office. The inspector general said his office enlisted an outside vendor and the Pentagon to help recover all of the text messages between Page and Strzok, which have been delivered to the Judiciary and Oversight Committees in tranches. Conaway said there may be "an interim step" before Congress holds the officials in contempt. As early as next week, Republican leaders could draft a resolution seeking to “get the full House on board with the demand that the House be respected and that the information be provided to the relevant committees." On Thursday, Rep. Jerry Nadler, D-New York, the ranking member of the House Judiciary Committee, claimed that a March subpoena Goodlatte issued to the Justice Department for various documents related to the Trump and Clinton investigations was "defective" because the majority didn't share an identical copy with Democrats as required by committee rules. That, Nadler argued, makes the subpoena "unenforceable as a matter of law," and would potential set back any effort to hold top DOJ officials in contempt of Congress for not complying. A House Judiciary Committee aide dismissed Nadler's claims, telling ABC News in a statement that the subpoena issued by Goodlatte was "valid" and that the "content was the same." ABC's Jack Date contributed to this report. Editor's note: An earlier version of this story said the Justice Department did not immediately respond to a request for comment. ABC News had contacted the Department of Justice after business hours Wednesday evening. ABC News obtained a statement from the Justice Department Thursday morning, after the story was first published, that had been provided to other news outlets on Wednesday.